This week, we once again took another small step towards our Africa Trip. 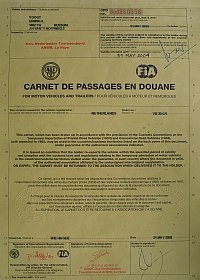 Following our application, we received back from the RAC, their quotation for our Carnet de Passage. 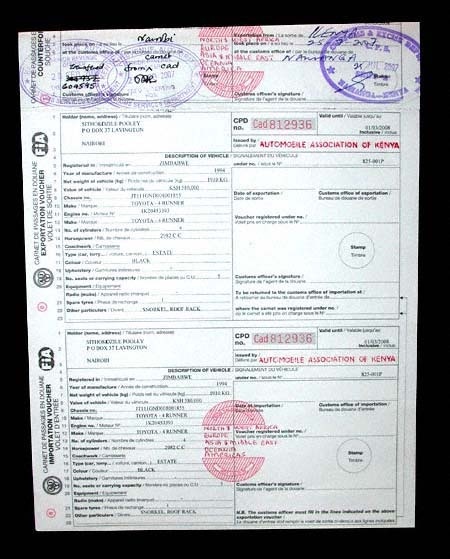 This is an importation/exportation document for the Truck, a passport for the vehicle,and is required for most African Countries and even if it’s only recommended, it can make life a bit easier at border crossings. The RAC are the only issuing entity in Britain. 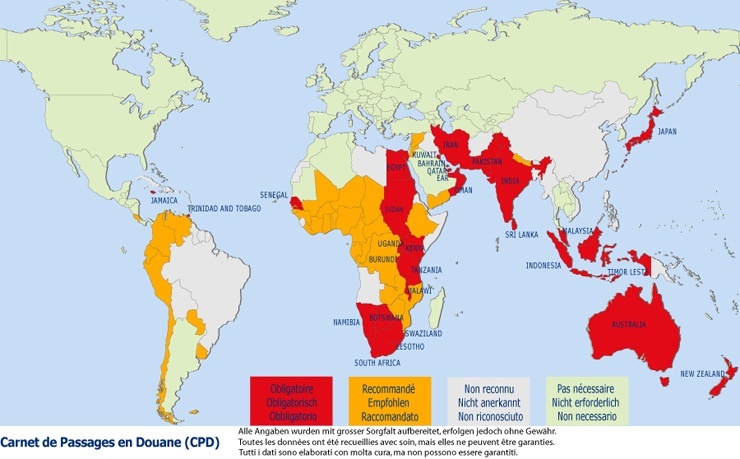 The following map shows the countries around the world that it is obligatory to have a Carnet (in Red), and those that it is recommended to have one (in Orange). We had a pleasant surprise as the RAC agreed our valuation for “Colonel K” of £5,000.00, and this brought the total price down for a 25 page Carnet, including deposit, and International driving Permits ( IDP’s) to just under £2,000.00. This is the initial cost and after repayment of deposits and 50% of the insurance premium that will be refunded on them receiving the fully completed Carnet back, it means that the cost is less than £950.00 for each 12 month period. Result! We had originally budgeted for valuing the Colonel at £45k, this would have meant that the total cost after refunded deposits etc would be about £6,000, this is a massive difference and translates into about 8000 litres of diesel in Africa, or an extra few months on our trip, ha. It seems that the valuation is done on the V5 and does not take into account any modifications to vehicles. This means that if we took the KTM bike, the Carnet would be twice as much as for the Truck that was carrying it! The only thing now is trying to work out how and where to renew the Carnet after it expires after 12 months. At this time we are still waiting to hear a definite answer from RAC. And have so far had 2 completely differing answers from them, neither very helpful. Our quotation covers all of Africa with the exception of Egypt, and Libya. We knew it wouldn’t cover Egypt and the requirement for this Country is 800% of the vehicle value, whilst the remaining African countries are requirement is 250% of vehicle value. We are still not sure about the exclusion of Libya, but as the country is still in turmoil after the civil war, I guess we have no immediate plans to cross this border! Obviously to get our deposits repaid, the Carnet de Passage has to be returned, fully stamped when crossing a border into a Country, and once again when exiting that same Country. But at least if it all goes “pear shaped”, and the Carnet gets stolen or some over zealous border official refuses to return it, it’s not stupid money to lose or to replace it. The IDP’s also only last for 12 months and so will also need to be replaced at the same time as the Carnet. Also rather annoyingly, both the Carnet, and the IPD’s, start at the date of issue from the RAC. So both will need to be paid for right at the last minute before departure, otherwise by the time we’ve got going, travelled down through Europe, crossed The Med, and spent several weeks in Morocco, we could be halfway through our 1st Carnet etc before we even enter Western Sahara and Mauritania. The book has to be completed for every border crossing for the deposit etc to be returned, and should a claim arise from a country up to 12 months later, the RAC can ask for payment for any such claim. It’s a bit of a minefield, but a necessary minefield to enable you to travel through the Continent of Africa. And a cheaper minefield than we were expecting. ← Who needs a dining room?